Mmmmm…fall. I love this time of year! 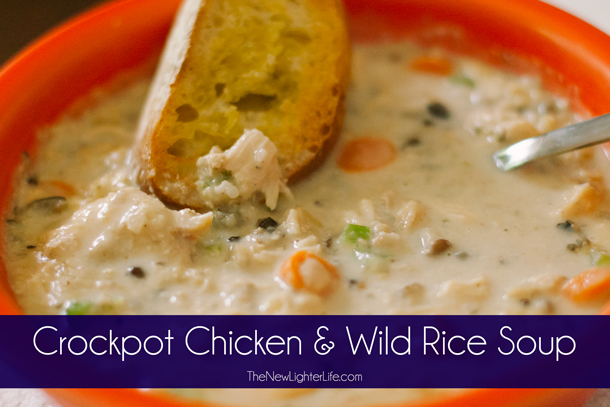 In South Texas, I get my soup on during the cooler weather and this Crockpot Chicken Wild Rice Soup is one of my favorites. It’s hearty and oh so good! While we were slaving away painting our house one recent Saturday, I threw this in and we got to enjoy it after a long day’s work. Yum! We do VERY limited bread but I suggest you don’t skip out on serving this with crusty bread. Perfection! Place everything in a 6 quart crockpot except the heavy cream. Cook on low for 7 to 8 hours. When finished cooking, shred chicken and add heavy cream to crockpot. Add additional water or broth if needed.